Now that you know where we were headed, I want to dive in to some of the most spectacular moments of the trip. I can’t lie, narrowing it down to five was harder than I anticipated. Budapest has an incredible amount of history, dating back centuries. Reminders of WWII, and later, life behind the Iron Curtain, are ever-present, with numerous memorials and stories still told by locals. 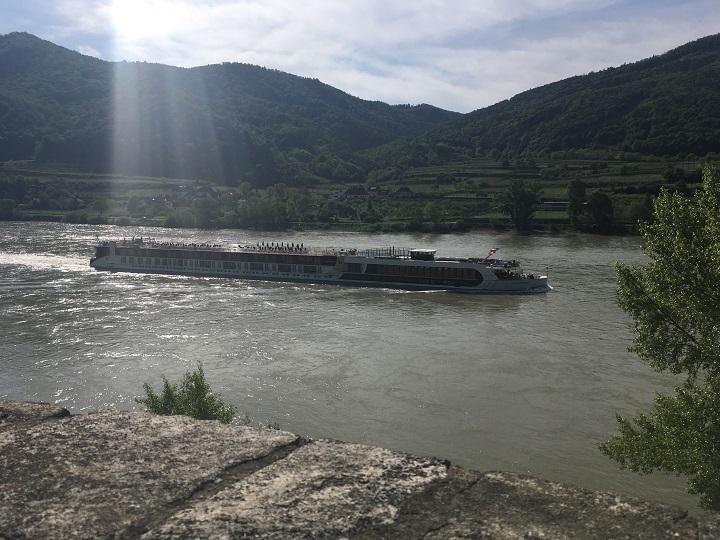 We arrived for our cruise a day early and maximized the time on our own as well as on our Active Hiking Tour up Castle Hill with AmaWaterways. But what stood out as the most memorable, especially since it was the first night of our river cruise, was the “Illuminations Cruise”/Evening Cruise provided by AmaWaterways. 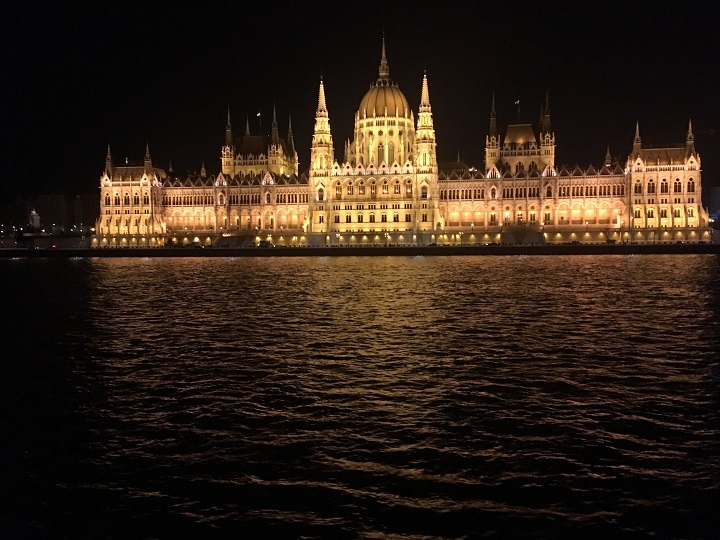 After we had all boarded, and enjoyed a welcome reception and dinner, the 166-guest AmaSerena set sail along the Danube for a 90-minute cruise – against a clear night sky, almost-full moon, and dark, shimmering waters. Along the Buda side, we saw the UNESCO-listed Castle District and its rampart, and the hilltop Liberty Statue, high above us. We gracefully slipped under the city’s bridges – also lit up – including the city’s most famous Chain Bridge. Our Cruise Manager, Mariana, softly narrated a few highlights via the ship’s speaker system, and mainly, we quietly stood against the railings of our ship and breathed in the fresh air – wondering in anticipation about the rest of the treasures this vacation would hold. 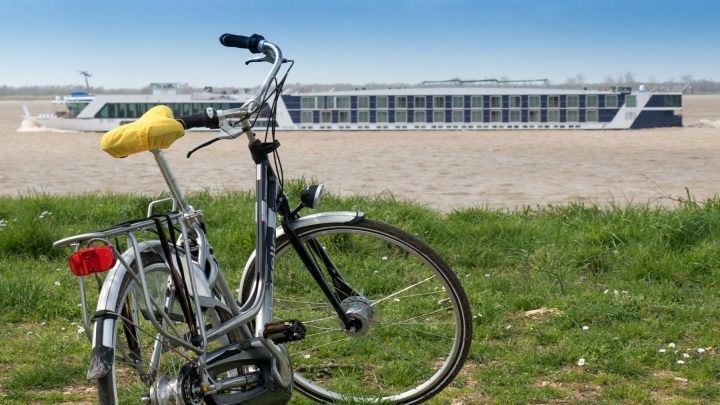 One of the factors that sets AmaWaterways apart from some of the other river cruise lines is that its European ships carry bicycles on board. I was curious to try them out. 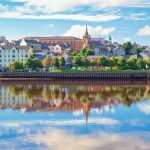 I ended up taking 3 bicycle tours over the course of our 7-day river cruise, and this one easily stood out as the best. As background, the Danube cycle path is a world-class bike path. According to my research, from the river’s source in Germany to the Black Sea it is about 1,800 miles and passes through 10 countries. The portion from Germany through Austria, Slovakia and Hungary is the most developed. On our tour, we were riding on this bicycle-only trail, and encountered only a few other bicyclists along the way. It made the tour wonderfully stress-free. A group of approximately 15 walked off the ship in Weissenkirchen, on a clear and warm early-May morning. We were greeted by two friendly, female, English-speaking guides sporting AmaWaterways jerseys. They had a clear knowledge of the rules of the road and gave us specific instructions as to how to follow along safely. I really appreciated their guidance as we traversed the 24 kilometers to Melk. We stopped a number of times, sometimesjust for a quick instructional on how to handle an upcoming curve or intersection ahead. 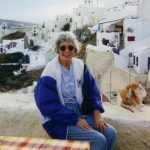 The most memorable was when we stopped in a village and the guides took us to an overlook in an old stone chapel, just as our ship, the AmaSerena, cruised by (it was headed toward our next port and we would meet up with it later). The sun shone down on the ship through a few clouds – I literally saw rays of sun pouring down upon it – and the captain saw us waving and blew the ship’s horn. I really felt like I was in a river cruise vacation brochure at this moment! 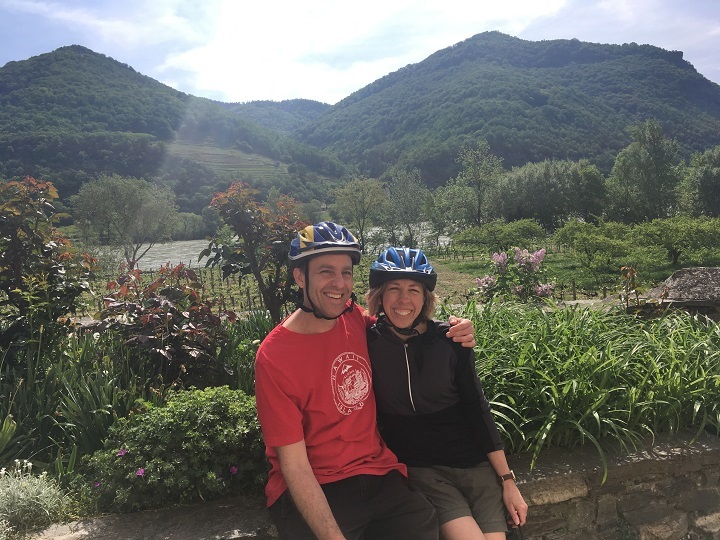 During other portions of the leisurely ride we passed through the Wachau Valley’s majestic vineyards, more beautiful scenery, and several small villages, where the locals greeted us with a smile and a “Morgen” (short for the German “good morning” greeting). 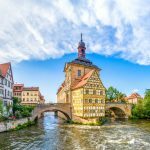 This bicycle tour is a great reason why AmaWaterways has bikes on board and I’d recommend it to anyone who is comfortable pedaling at a relaxed yet fairly continuous pace. In total, I recall the tour lasting about 3 hours. And if you’re wondering, aside from my 40-something husband and myself, it seemed that everyone else on the bicycle tour was in their 50s, 60s and 70s. 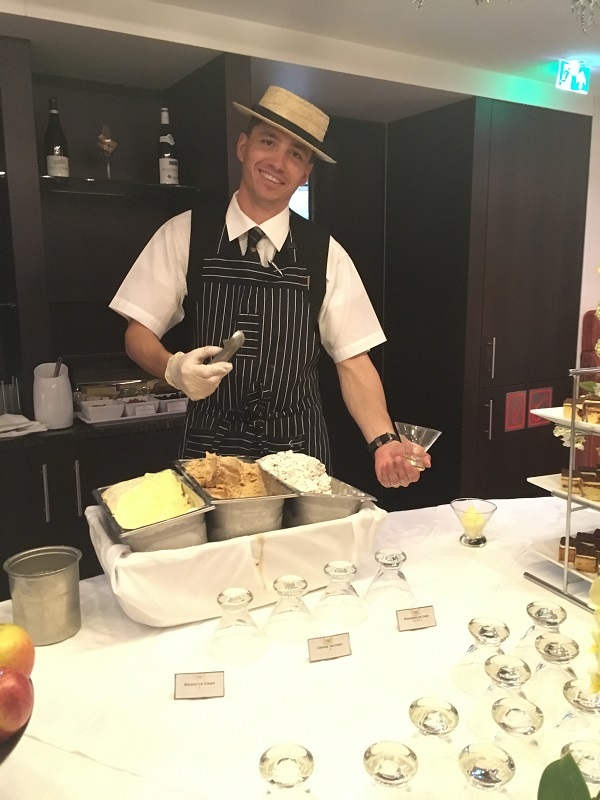 Every river (and ocean) cruise line touts its dining program. As far as keeping its promise of fine cuisine, AmaWaterways is right up there with the best of them. AmaWaterways and President Rudi Schreiner are part of the prestigious La Chaine De Rotisseurs, a gastronomic society dedicated to fine cuisine. 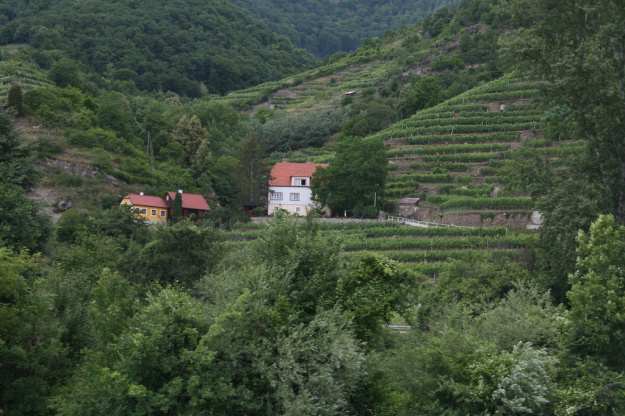 However, you don’t need to be a bon vivant to recognize the deliciousness of AmaWaterways. Each morning there was a plethora of options set up, buffet-style in the aptly-named Main Restaurant, including made-to-order eggs/omelettes, and a number of other hearty options. A tempting array of baked goods was also available. The wait staff greeted us cheerily, and ensured we had whatever caffeinated beverages or fresh-squeezed juices we needed to start our day. Lunch consisted of a couple of entrée options (usually regional specialties from what I could tell) along with an ample buffet in the main dining room each day, as well as a “light lunch” in the Main Lounge. 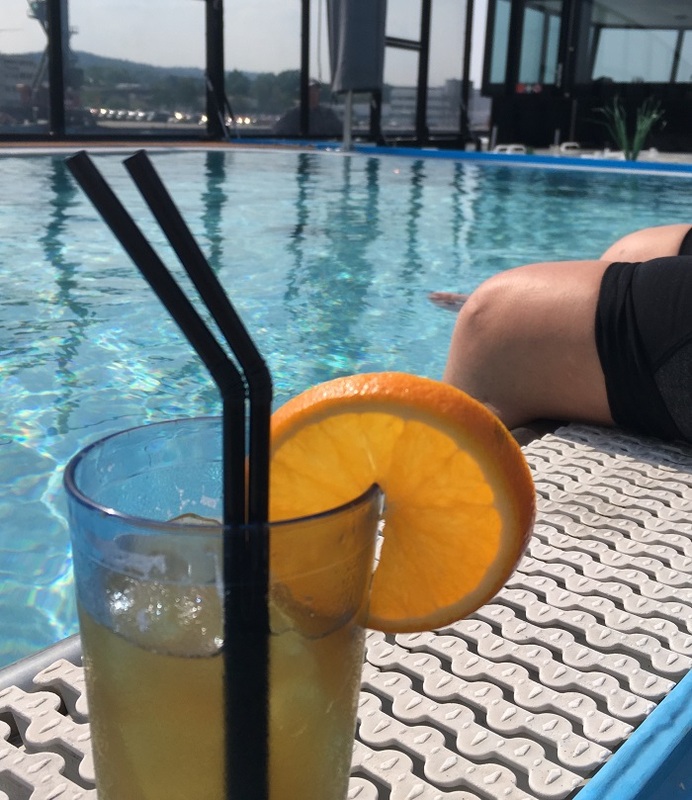 While most people opted for the dining room, my husband and I frequently opted for the light lunch to save ourselves time so we could explore more – and also so that we could walk with our lunches up to the top sun deck and enjoy it al fresco. What a delight. Dinner was the main attraction, with each evening featuring a 4-course meal, along with free-flowing regional wines or beer. The wait staff was again at the top of its game, very friendly, and eager to tell us about the wine selections for each evening. The portions were appropriately sized and beautifully presented. It was as impressive as any fine dining experience I would opt to have in a restaurant on land. 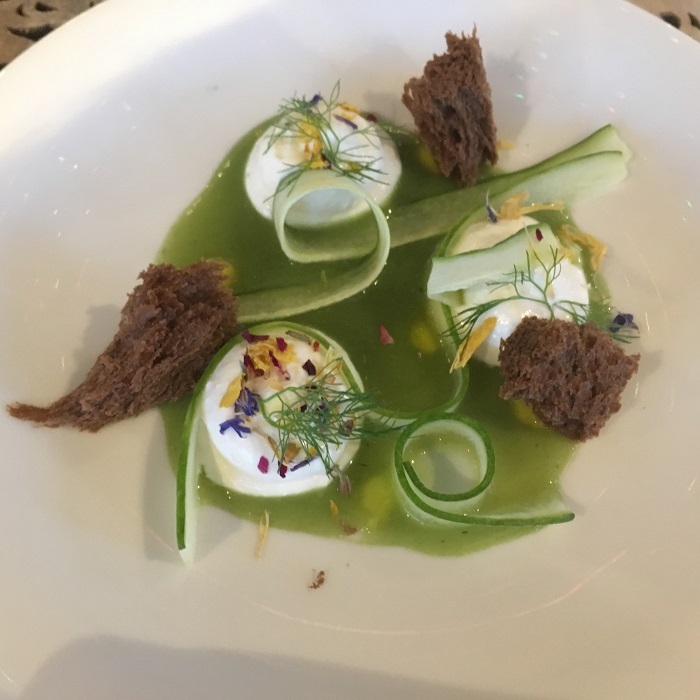 I should mention that it was also fun, in this region known for its world-class cakes, to try AmaWaterways’ take on local desserts, such as Sacher Torte in Vienna. It did not disappoint! The crew are the first people you meet and often the last people you see on a river cruise. I can still remember the friendly security guard who greeted my husband as we walked up to the ship in Budapest, and his warm smile. Every time we stepped off the ship or got back on, he was there to remind us to swipe our card that tracked who was on the ship and ask us how we were. From there, we met Mariana, the effervescent, Argentinian-born Cruise Manager, who spoke multiple languages, had endless energy, seemed to be an eager problem solver and listening ear, and if you are an ocean cruiser, was essentially a combination of the shore excursion manager and the cruise (social) director. In other words, she was everywhere. She called us by name, was easily accessible, and seemed genuinely interested in the well-being of each passenger. Mariana led nightly informational sessions in the lounge to remind all guests know about the tours being held the next day, as well as other logistics. I approached her several times throughout the week with questions about tours, and when we changed our mind on two different evenings about which tour we wanted to take the following morning, she accommodated us both times. Everyone else, from our housekeeping staff, to the wait staff, bar staff, hotel manager, the blue-shirted sailors who guided us through the locks and more, right up to the captain, made us feel at home. Because I said I’d limit this list to 5, I’m not sure which final aspect to highlight. The final night of the cruise, we were treated to a private Oktoberfest for AmaWaterways guests in Vilshofen. This was a free-spirited event, held in a large tent just steps away from the ship. 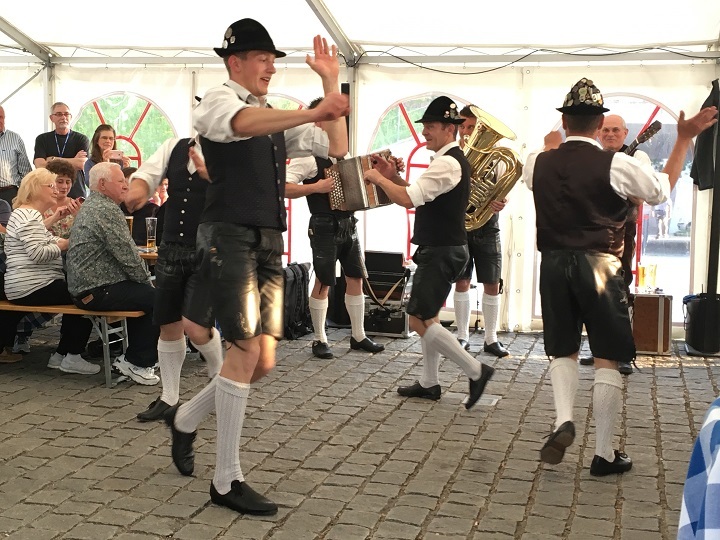 Local musicians performed and danced, we enjoyed pretzels and beer, and the captain even donned his lederhosen. It was a memorable way to cap off our trip! But I can’t end this post without giving a little more credit to the Active Walking Tours, which is why I give that the “tie” for #5. 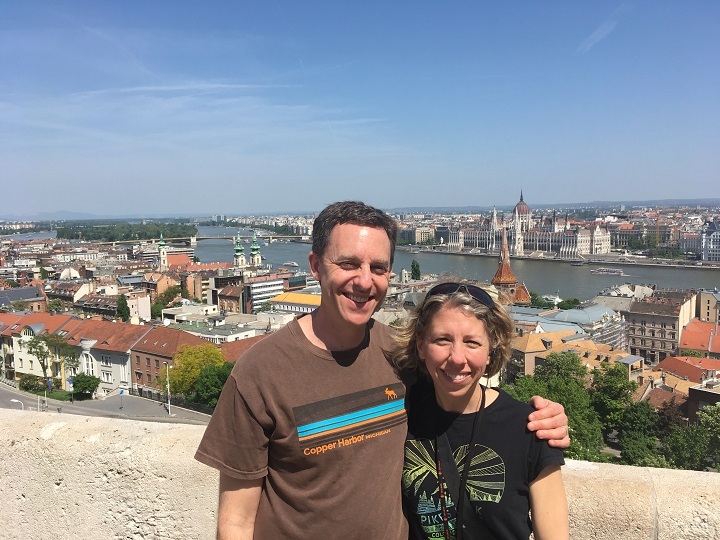 I previously referenced our Active Walking Tour in Budapest, which was actually quite a vigorous hike around Budapest, lasting almost 5 hours, more than the allotted time. Our guide was so fascinating and such a storyteller, sharing many personal insights as well as information about landmarks along the way. His knowledge was deep and wide-ranging. We wound from the ship’s docking position in Pest, through a large portion of the Parliament District, then across the Chain Bridge and up the hill on the Buda side, to see more historic buildings and gaze upon on the Danube and Pest side below. There were only 8 of us (4 couples) that opted for this complimentary tour, so it seemed like a best-kept secret. 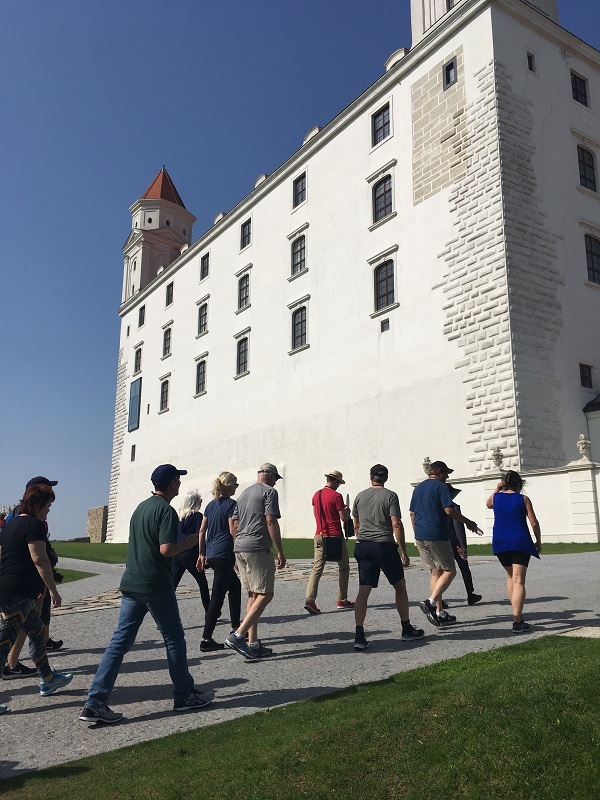 We also took somewhat less rigorous, yet also very interesting, Active Walking Tours in Bratislava, Passau, and Cesky Krumlov, all with excellent local guides. 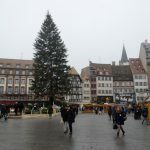 In other words, if you like the idea of covering more ground over a period of a few hours, can handle cobblestone streets and a few staircases, without having to stop and rest, then I highly recommend trying an Active Walking Tour with AmaWaterways.